Among DoD’s cyber personnel and forces, the Cyber Mission Force (CMF) has a unique role within the Department. Once fully operational, the CMF will include nearly 6,200 military, civilian, and contractor support personnel from across the military departments and defense components. Cyber Mission Force. 133 teams by 2018. State and non-state actors threaten disruptive and destructive attacks against the United States and conduct cyber-enabled theft of intellectual property to undercut the United States' technological and military advantage. DoD must develop its cyber forces and strengthen its cyber defense and cyber deterrence posture. National Mission Teams. 13 teams. Defend the United States and its interests against cyberattacks of significant consequence. Cyber Protection Teams. 68 teams. Defend priority DoD networks and systems against priority threats. Combat Mission Teams. 27 teams. Provide support to Combatant Commands by generating integrated cyberspace effects in support of operational plans and contingency operations. Support Teams. 25 teams. Provide analytic and planning support to the National Mission and Combat Mission teams. Of the four types of teams that make up the cyber mission force — the 133-team cadre of cyber warriors the four service branches provide to U.S. Cyber Command — cyber protection teams (CPTs) serve as the quick reaction defensive force responding to network intrusions. Each 39-member CPT is broken into four sections. The first, is a headquarters section, which takes care of the administrative part of managing and running a team in addition to taking care of some of the planning in preparation for a mission. Next, there are two mission elements and a support element with the idea that each element has the same personnel and equipment and can be exchanged as need be and push them out on missions separately if required. CPTs can be thought of as quick reaction forces to assist local owners and are not meant to remain on the network for an extended duration. Army CPTs, have a broad range of missions,. These include assisting network owners or the local defenders, educating them on CPT capabilities and trying to leave the network in a much more defensible position, training and vulnerability assessment. The network operators have a difficult job, they are on call 24/7 and focused on vulnerabilities. CPTs show up for a short duration with a threat focus and help them close the gaps consistent with that particular threat, When they show up, they bring their own kit that includes hardware (server stacks), software and sensors. These kits provide teams with multiple tools, including: network assessment equipment; host forensics equipment, allowing them to look at the entire network and specific work stations; rudimentary defense mechanisms; plus a substantial amount of storage capability and comprehensive amount of computational power. The combination allows them to flexibly create tools on the fly from their repository of tools to figure out what their exact setup needs to be. These kits are standardized among the cyber protection brigade and for Army Cyber. Across the joint force, however, service has a different type of kit, despite CYBERCOM producing a standard requirements document that all kits must meet standard baseline requirements. This brings me to the question ; where are we. People involved with cyber in the services perhaps can corelate. Four years back the then Prime Minister announced creation of cyber command. Present Government also has reiterated the same. It is still not on ground. There are host of issues which need immediate attention. I have tried to highlight those in a paper submitted to VIF for publication. Hope it sees the light of the day. More of cyber in my later papers. The Second Battle of El Alamein began on Oct. 23, 1942, 75 years ago, and ended less than a month later. It was preceded by just a few months by the First Battle of El Alamein, fought in Egypt without a decisive winner. The second battle didn’t end the North African Campaign of World War II, in which Allied and Axis powers competed for control of the region, but it made a German victory impossible. Like Midway, Guadalcanal and Stalingrad – the other battles that closed the door on an Axis victory – El Alamein was a strategic win for the Allies, and it defined the rest of the war. Late last month, the world of police cooperation got just a little wider as the Palestinian Authority joined Interpol. To an old counterterrorism agent like me, the vote to allow the Palestinians into the organization, which helps connect police agencies worldwide, represents an important shift in the world of law enforcement. 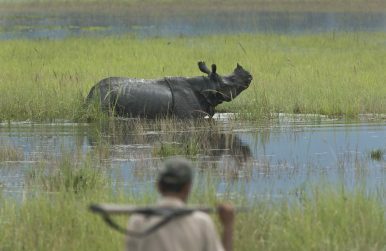 No sooner had India wrapped up celebrations of its annual “Wildlife Week” (October 2-8) — spotlighting the richness and diversity of its flora and fauna — than the sensational conviction of a notorious group of Indian wildlife traffickers grabbed headlines. The gang was involved in smuggling the body parts of 125 tigers and 1,200 leopards. But what had animal activists up in arms was the disproportionately small punishment (four years in jail) meted out to the criminals compared to the magnitude of the crime they had committed. The Trump administration has joined its predecessors in warning leaders in Islamabad and Rawalpindi of dire consequences by continuing to harbor groups that are active in Afghanistan, Jammu and Kashmir and occasionally, with spectacular destructive effect, in major Indian cities. U.S. threats have been articulated for so long that Pakistan’s national security community might be forgiven for not taking Team Trump’s “one last chance” warning seriously. After all, Washington still needs Pakistan’s help to arrive at a political settlement in Afghanistan and to provide logistical support for U.S. troops stationed there. And besides, nothing in diplomacy is forever. “What government?” scoffed Abu Ali, a local Turkmen force commander affiliated with the League of the Righteous, a powerful Iranian-backed Shi’a militia, when we asked whether he took orders from Iraqi forces or the central government. He lumped all Sunni Arabs in with the extremists who had abused his Shi’a sub-community in Tuz Khurmatu, south of Kirkuk, and disparaged the Kurds as “backstabbers” and “cheats” who had done too little to stop the extremists and then manipulated the fight against ISIL to seize control. When President Xi Jinping of China took power in 2012, digital cash hardly existed. Last year, the Chinese made $9 trillion in mobile payments, 80 times more than Americans. Chinese consumers pay for 25 percent of their purchases with digital cash delivered by a mobile phone app, and about one in seven carry no paper currency. In big cities like Shanghai, it’s hard to use paper to pay taxi fares or restaurant bills. Six years after the nonprofit corporation first reviewed the prospects for war between China and the U.S., it looked again at the issue in a report titled "Conflict with China Revisited" and felt less confident today that a Chinese-U.S. military clash will not take place in the future.Citing China's increased political, economic, and military capabilities, the report identified six sources of potential conflict between the two world powers -- North Korea, the South China Sea, Taiwan, cyberspace, Japan, and India. At its First Plenum on October 25, 2017, the 19th Central Committee of the Chinese Communist Party (CCP) elected members of the Politburo Standing Committee. 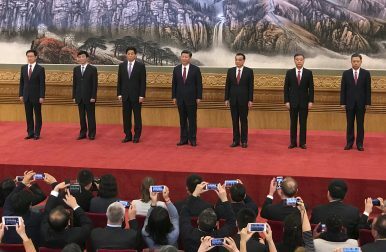 As widely expected, among the seven members of the 18th Politburo Standing Committee, four (Zhang Dejiang, Yu Zhengsheng, Liu Yunshan, and Zhang Gaoli) retired due to their age; and two (Xi Jinping and Li Keqiang) were re-elected. As for the final member, contrary to the speculation that Wang Qishan might stay on, he also stepped down possibly because of his age. One day after the Chinese Communist Party (CCP) revealed its new generation of top leaders — the seven members of the Politburo Standing Committee (PSC)— China’s state news agency Xinhua published a report elaborating on how the top leaders were selected from the “black box” of CCP elite politics. 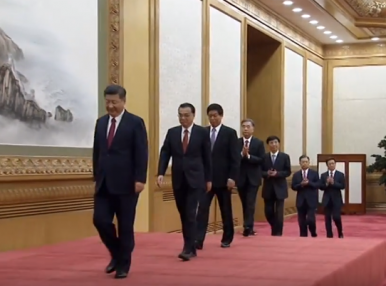 While it contained lengthy propaganda and numerous ambiguous descriptions, the article still implied the fundamental selection criteria for China’s top leadership: loyalty to the party and to Chinese President Xi Jinping. Thursday, the Russian military test fired three intercontinental-range ballistic missiles (ICBM) as part of a routine exercise of the Russian strategic nuclear forces, the Russian Ministry of Defense (MoD) said in an October 26 statement. 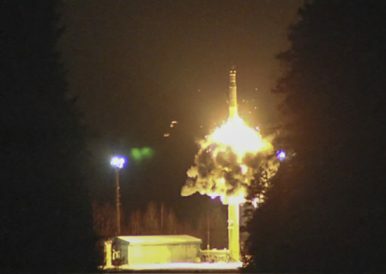 “A squad of the Strategic Missile Force fired a Topol intercontinental ballistic missile from Plesetsk towards the Kura test range in Kamchatka,” the MoD said. The missile was launched from a road-mobile transporter erector launcher. The Plesetsk space center is located in Arkhangelsk Oblast, approximately 800 kilometers north of Moscow. The changes come as Xi has initiated a massive modernisation programme for the country’s military to make it a leaner and more efficient fighting force. Here are the details of the changes and what it means for the world’s biggest armed forces. Is the Philippines up to the task of handling the latest wave of Islamist terrorism? 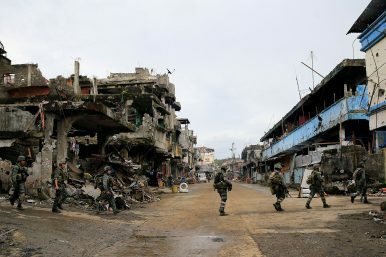 On May 23, a unit of the Armed Forces of the Philippines (AFP) operating on a tip, moved in on a safehouse in the southern Philippine city of Marawi, where a top Abu Sayyaf leader, Isnilon Hapilon, was said to be holed up. It was a setup. What was supposed to be a quick operation turned into a four month quagmire, with a death toll of some 147 members of the security forces and 45 civilians. Like the botched Mamasapano raid in January 2015 that led to the death of 44 Philippine National Police Special Action Forces, this was a tactical fiasco with strategic consequences. In a closed-door meeting at a Washington think tank in late July, I had the opportunity to ask a high-ranking Iraqi Kurdish official whether he worried that Kurds might be overplaying their hands in Iraq and Syria. I wondered whether regional powers couldn’t reverse the results of the September 25 independence referendum in Iraq’s Kurdistan Regional Government (KRG) and Kurdish gains against ISIS in Syria. As a historian of the twentieth century, I expressed concern that the Kurds, rather than attaining their century-old dream of a national homeland, could be pushed back by their neighbors and international powers as they were in the 1920s, 1946, 1961, 1975, 1988 and 2003. Despite tough talk about Rocket Man and North Korea, there has been little substantive action on the security front from the Trump administration and the Department of Defense. With the exception of farther-north-than-normal B-1B bomber flights, it appears to be business-as-usual in these unusual times. There may be more behind the scenes, but visible and substantial action is needed to deter aggression from the Democratic People’s Republic of Korea (DPRK). The use of electronic surveillance by intelligence and law enforcement agencies has flourished, and the Herzliya-based NSO Group from has become a leading player in this industry. Its product, Pegasus, entices users to click on links that allow almost unlimited access to their cell phones. The intrusion is also very hard to detect. On Dec. 1, 2013, at least half a million people gathered on the Maidan, the large public square in the center of Kiev. They came to express their outrage at Ukrainian President Viktor Yanukovych, who the day before had sent Berkut, his riot police, to bludgeon the students protesting his sudden refusal to sign an association agreement with the European Union. For these young people, Yanukovych’s decision foreclosed the European future they had imagined for themselves. For the hundreds of thousands who joined them on the streets after they were beaten, Yanukovych’s violence against Ukrainian citizens broke an implicit social contract. Although organizations spend more than $24 billion annually on leadership development, many leaders who have attended leadership programs struggle to implement what they’ve learned. It’s not because the programs are bad but because leadership is best learned from experience. Still, simply being an experienced leader doesn’t elevate a person’s skills. Like most of us, leaders often go through their experiences somewhat mindlessly, accomplishing tasks but learning little about themselves and their impact.